Before you look at the pictures, yes, the Easter Bunny did make it to our house. We just don't have any pictures of it. We were so busy getting Gareth ready for church and then trying to keep him from the other baskets that I never even thought to get the camera out until well after his basket contents had mostly disappeared/been put away out of his reach. Gareth got some bubbles and an Etch-a-Sketch, both of which he enjoys (bubbles are apparently yummy). My parents came out for Easter and we had a great time having them here. Gareth learned to say "Pops" and "Gram" while they were here, and he seems to be remembering that that's who they are! Dad tried to teach him some French as well (things like "tu es bete"), but the only thing that stuck was saying "Salut!" whenever my dad put his hands on his head. Gareth would only do that for Pops though. 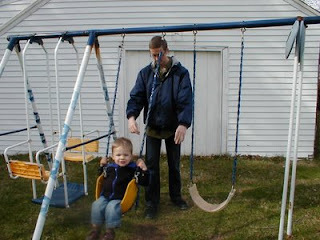 Gareth loves this rusty, mildewy swing set. He'll start on the double swing (on the "floor" of it), move up to the double swing seats, then on to the yellow swing, the white swing, then the slide. Pops taught him how to go down head first. Thanks, Pops. So, most of those recipes are from Southern Living, which should tell you everything right there. But, man, were they delicious. We had to do two desserts because there were too many delicious recipes to choose from. It was difficult to narrow it down to those two even. Do yourself a favor and print out the cake recipe. The cake itself is just a regular yellow cake, and it has become one of my favorites. I think it's the moistest cake I've ever had - better than store-bought. Ryan wasn't a huge fan of the lemon filling, so we'll experiment with different fillings (but if you like lemon fillings, this one was good). And the icing is just a basic cream cheese icing with coconut sprinkled on at the end. An uneventful, but very enjoyable Easter. Glad I could help out on that slide technique. I was going to teach him how to bail out from the swing too but figured you might freak out at that one if he did it unexpectedly!. What are pops' for if not to teach tricks to drive mom nuts. I ditto the cake approval. Very delicious and you can always diet next week - after you poison the deer I mean discourage them from eating your garden as outlined in my prior comment. Welcome Spring!!! It is about time you arrived in NJ. So we go from 45 two days ago to 87 forecast for Sunday. I mean Mal, Guy took away my normal seasons, how weird is that. Now I have to sweat mowing the lawn, no casual cruise across the green. Call Al Gore I want a full investigation. Gareth looks fantastic on that swing. He's getting so big! 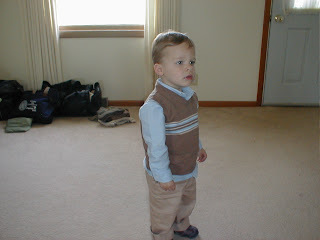 He looks like such a handsome little man in his Easter outfit too!